Despite the economic crunch, chocolate remains a lucrative industry. The International Cocoa Association reported that net sales of confectionaries reached $55 billion worldwide in 2011. And with so many gourmet chocolate around, clearly you need some guidance on which ones to purchase and savor. Forbes contributor Carol Pinchefsky lists down the five “best chocolate you’ve never tasted,” which she assures would leave chocoholic lovers hooked. Note that some of these bittersweets are not commonly seen in stores and you would have to look really hard to find them, either online or in specialty shops. 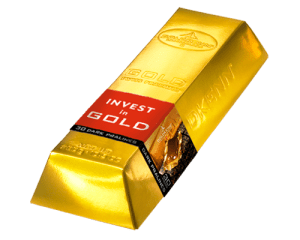 Goldkenn Black Praline Goldbar (pictured) – This Swiss chocolate bar is fashioned like a gold bar, with the right amount of sweetness and “unctously smooth.” Thin layers of almonds and hazelnuts offset its creaminess. Uli Mana Dark Cacao Truffles – Organic and raw, the Dark Cacao Truffles by Uli Mana is known for its earthiness and dense richness. They are flavored with agave instead of sugar, so you get the chocolate rush without the sugar high (notoriously followed by the sugar crash). These confections come in ball form, not bar. Mast Brothers Fleur de Sel – Mast Brothers is one of the most exhorbitant chocolate brands and rightfully so. What they do to chocolate is close to perfect, such as its Fleur de Sel bar. As every chocolate lover knows, just the right amount of saltiness could dial the flavor of cocoa to 11, and this bar did just that. For the second straight year, Kyoto-based chocolatier Susumu Koyama has been awarded with top distinction among foreign chocolate masters by France’s Le Club des Croqueurs de Chocolat. Meanwhile, his Patissier es Koyama confectionary store in Sanda City, located north of Kobe, was awarded the highest rating of five bars (an equivalent to five stars, also for the second straight year) in the latest edition of the group’s guidebook, Le Guide du Club des Croqueurs de Chocolat. 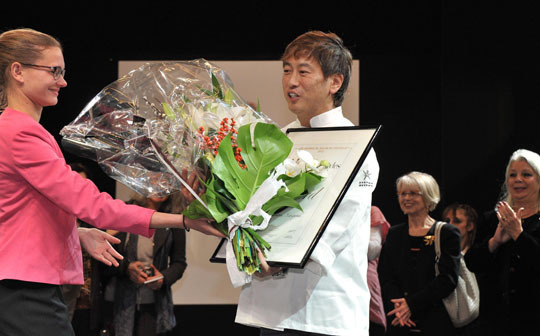 The awards ceremony was held last November 2nd at the Salon du Chocolat global chocolate fair in Paris, France. “I appreciate that I have been given an opportunity to experiment with chocolates to such an extent (since winning the 2011 award),” Koyama said. With no overseas training, 48-year-old Koyama became the first Japanese five-star winner in 2011. This year, he was awarded for creating five new varieties of chocolate, some of which have butterbur sprouts and sake lees as ingredients. Koyama said he is already developing new chocolate recipes, including one that uses ingredients unique in Kyoto, in preparation for next year’s contest. No matter how some people deny it, the effects of climate change have been very evident from shrinking glaciers, rising sea water levels, to shifting regional climates. This rapid escalation of change in Earth’s climate, which has been scientifically concluded to be man-made in nature, is significantly affecting agriculture including the cocoa beans that make up chocolate. Crops grow within a relatively narrow range of climatic conditions, with the right amount of rain and sunshine, as well as the right kind of soil among other requirements. For instance, coconuts do not grow in places with cold climate, while strawberries cannot be harvested in warm environments. As for the cocoa trees, they grow in tropical climate. 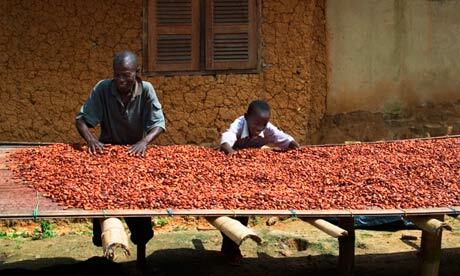 However, several cocoa-growing regions such as West Africa are getting too hot to support the cocoa crop. Farmers are also worried about a fungal infection that could ruin cocoa trees and drive the price of cocoa beans significantly high. While it will take time before cocoa becomes unsustainable in areas where they used to flourish, steps have to be undertaken to prevent it. Researchers, for instance, can develop drought-tolerant plants that can handle hotter, drier conditions. They can also develop plants that are resistant to fungal infections.